Jammu and Kashmir municipal polls HIGHLIGHTS: The Bharatiya Janata Party (BJP) swept the Jammu Municipal Corporation polls while Independent candidates won majority number of seats in the Srinagar Municipal Corporation. Counting took place at Sher-i-Kashmir International Conference Centre (SKICC). Of the 74 wards in the Srinagar Municipal Corporation, Independent candidates won 49 seats, Congress got 12 seats, BJP secured four seats, while in one ward no votes were polled and 8 seats remained uncontested. In the 75-seat Jammu Municipal Corporation polls, the BJP secured 43 seats, Congress won 14 while Independent candidates got 18 seats. Meanwhile, the Jammu and Kashmir Pradesh Congress Committee (JKPCC) which has emerged as the single largest party of the Srinagar Municipal Corporation (SMC) in a quote to PTI said that they were ready to join hands with ‘secular-minded’ winning candidates or groups to form the new municipal body. “I would appeal all the winning candidates who have secular ideology and believe in this mission of not having a communal (forces) backed committee or mayor at least in Srinagar (Municipal Corporation). We are ready to go with or take along any group which comes forward to stop communal forces,” JKPCC president Ghulam Ahmad Mir told reporters in Srinagar. Election to the urban local body polls was held in four phases from October 8 to October 16. There are over 3,000 candidates who contested the 1,145 wards across the state. In Kashmir, which has 598 wards, at least 231 candidates were elected unopposed while no candidates contested in 181 wards. Three seats have been declared so far. The voter turnout in the polls was low, with 8.3 per cent votes cast in the first phase on October 8, 3.4 per cent in the second phase on October 10, 3.49 per cent in the third phase on October 13 and 4.2 per cent in the last phase on October 16. The overall percentage was 35.1 per cent. 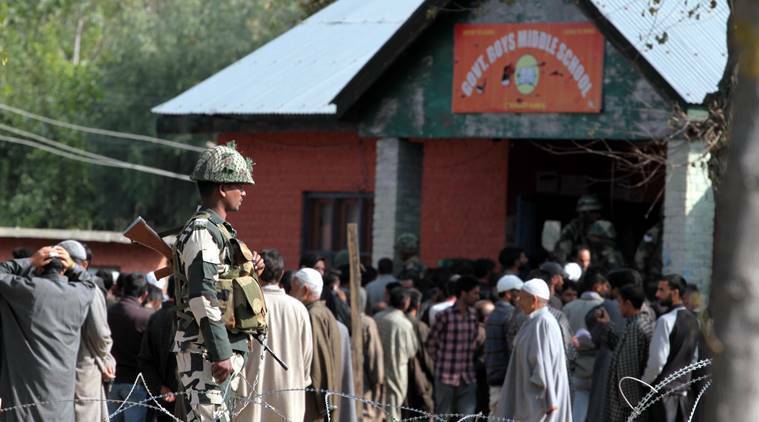 During voting, there were no signs of any electioneering in the run up to the polls as militant outfits had threatened to target those taking part in the elections, while separatist groups including the Hurriyat Conference boycotted the elections.